The dog life must be nice being walked everyday by dog moms! As we have a few dog moms on our Think Dirty team, we know exactly what other pet parents want. Dogs can get competitive with dog toys! They love their tug-o-wars and wait..there’s more! It’s partly a cuddly snugge toy. Let your dog tug, squeak and flop or simply cuddle up and snooze. 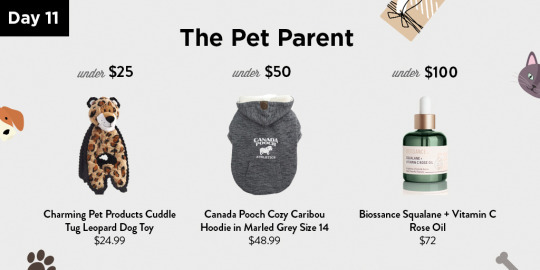 Get a dog in your life winter ready with a Canada Pooch Cozy Caribou Hoodie. Stand out, be stylish, yet easy to clean gift that any pet parent would love. Want to give a gift someone will be excited to open? The Squalane + Vitamin C Rose Oil is perfect for pet parents who care for their skin. This face oil will visibly brighten, firm, and evens the look of skin tone and texture. Happy skin leads to a happy pet parent!